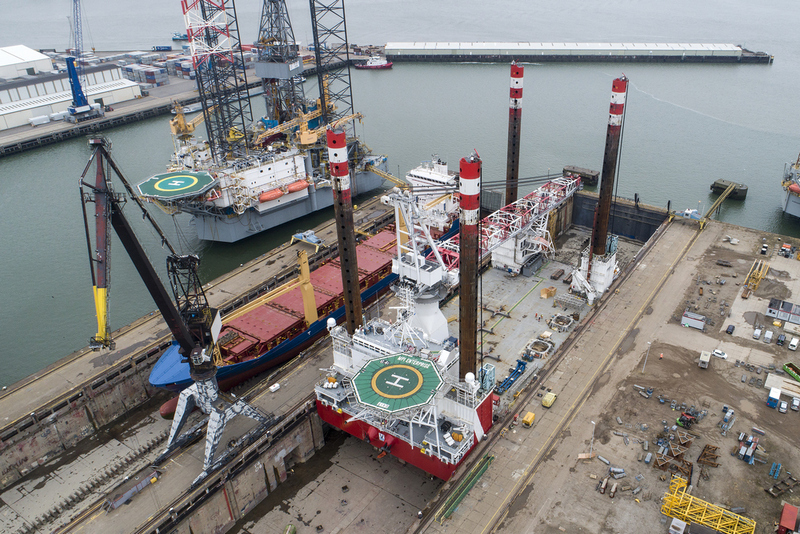 Damen Verolme Rotterdam (DVR) has completed a refit project on the MPI Enterprise, a 120m self-elevating DP2 wind turbine installation vessel owned and operated by MPI Offshore, part of the Vroon Group. 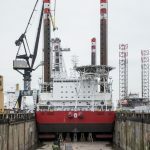 The works included the installation of spudcans on her four-legged jacking system, which can elevate the vessel at rate of one metre per minute in water depths up to 45m. 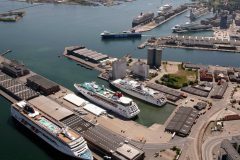 Acquired by Damen Shipyards Group in June 2017, DVR is one of the largest refit and repair yards in Western Europe, capable of accommodating any seagoing vessel or floating offshore unit. 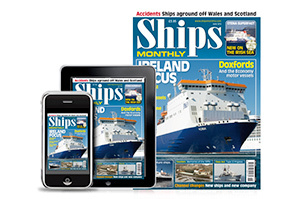 Damen Shiprepair & Conversion has worked with MPI Offshore in the past. 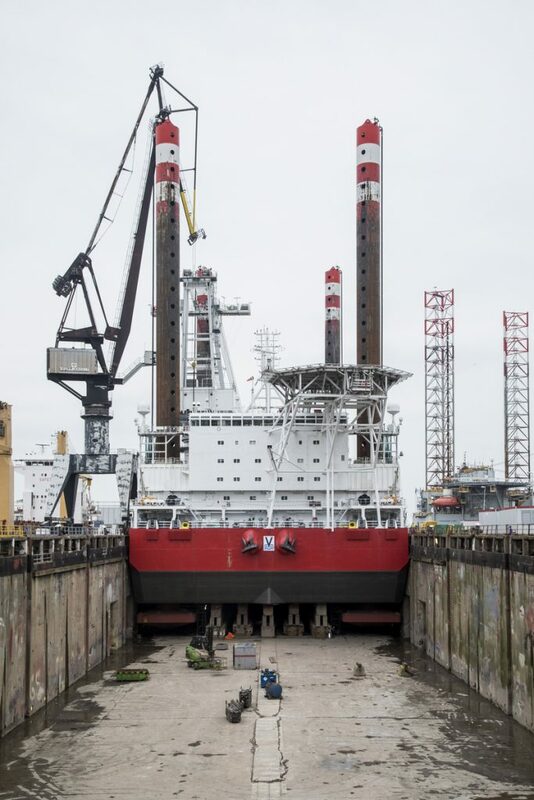 MPI Resolution had visited DVR in 2011 for crane testing and so the yard was pleased to welcome the MPI Enterprise in February 2018 for the first time, for some refit work. 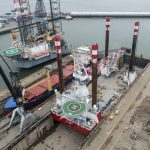 She is designed to transport, lift, install and decommission components such as foundations, wind turbines, met masts and transformer stations. 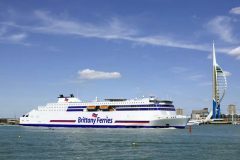 The works were contracted and managed by NSB Niederelbe Schiffahrtsgesellschaft mbH & Co. KG, the vessel’s manager since it was first delivered in December 2011. With respect to the installation of the new spudcans, this was the second such project at DVR, with the sister-ship of MPI Enterprise undergoing the same refit at Verolme in June 2012. This time, however, the scope additionally included the installation of two radar domes and architectural work in the lower quarters. Cylinder foundations were also fitted for the leg lashing system. Fitting new spudcans on each of the four legs was a major enterprise, with 16 tensioning bolts per spudcan. The new spudcans were lowered into the drydock using the onboard crane and then each was moved into position by self-propelled modular transporters. Mechanical linkage in spudcan design is unusual, and the advanced design was implemented using shim plates to divert radial and torsional movement from the tensioning bolts. The new spudcans increase the load-bearing area when the vessel is jacked up and so reduce the penetration into the seabed.